High or low blood sugars during and after exercise? Not being able to reduce your A1C and being stuck on the “blood sugar roller coaster”? Not being able to lose weight or build muscle? 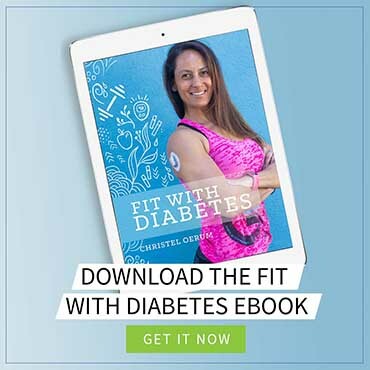 Not knowing what to eat and how to exercise to reach your diabetes, health and fitness goals? Then let me support you in reaching your health and diabetes goals. I offer individualized online diabetes coaching sessions to address what’s most important to you when it comes to managing your health and diabetes. The time is yours, and my goal is that you will leave each session with the tool and knowledge to move forward successfully. If you are interested in scheduling a 15-minute introduction call to learn more about my approach, please send me an email at [email protected]. “As a type 1 diabetic, I admit I was often afraid to go to the gym because I was afraid of going hypoglycemic. Christel really helped me learn how to manage my sugars, giving me the confidence I needed to get back to the gym on a regular basis. Try tracking your blood sugars to determine if this is a consistent trend for you. If it is a consistent trend you can consider taking a small insulin dose (will depend on your type of insulin) before, during or after your workout to prevent the high. Does your book address help with weightloss? I was miss diagnosed at age 40 as t2until this past july a new doctor took me off my insulin and less carbs and went into DKA. T1 lada 5 shots daynow and gained 231bs. Hi. I am a boy of 17 and basically am a underweight boy since my weight is around 45kg. So I calculated my daily calorie requirement by your method and it’s coming around 1410cal . So I wanted you too suggest some meal plans for me cuz am really depressed.Please, thank you. If you want to gain weight I’d suggest you add a few hundred calories to your maintenance calories. If you want it to be muscle weight gain you’ll have to add in resistance training as well. Hi Cristel, I am 51 and Type1/Type 2 or Type 1 1/2, as head of Endocrinology at UAB 18 years ago said. My doctor said my A1C waswas “unacceptable” and my sugars 2 hours after dinner at bedtime are frequently in the 400s. My husband does not help me control carbs and I frequently toast cinnamon/raisin bread to keep my sugar from dropping. I sometimes have low sugar in the morning. He has to get me up at 7 before leaving for work to feed me if so. I am deaf and hear with cochlear implants but not first thing upon waking. So typing is great for me! Just telling you that your A1C is “unacceptable” and then walking away is not OK! He should have asked you how he could help you manage your diabetes. Without the right base knowledge, how are you supposed to know how to manage it. – First, you can eat carbs, but you need to know how to dose your insulin for it. Learn how many units you need to cover your carbs and you’ll make great headway. Some need 1 unit per 10 g of carbs some need way more, so you have to be diligent and test it out (write down your findings). – Have a juice box or glucose tabs by your bed to treat low blood sugars. Grab that for emergencies, don’t start cooking. – If you go low a lot, even when you haven’t eaten your basal is most likely too high. Go back to your doctor and discuss how you can adjust your basal so you don’t go low. Write things down and show him, demand that he supports you! Hi there just wanted to let you know i just sent you an email and i need serious help please get back to me! Please send me an email at the email listed on the page ([email protected]) with details on what you’re looking for and I’ll get back to you. Wondering whst your program include and cost. I have been diagnosed lada 6 months ago after living t2 for 14years. I need help with diet and weight gain sunce starting insulin. Hi, just wanted to let you know I sent a message! Thank you for all your great advice! I just used the above messaging system for your website, but I’m just leaving a comment as well. From what I see, a few people were having with the message system. T1D needing help with losing weight and pre-post exercise blood sugar. Hopeful! Hi! I am a T2 adult onset since 2008. December 2017 I started on insulin. I struggle to lose weight and am looking for some help. I would like to do meal planning with healthy foods and not getting hungry throughout the day. Thank you for any advice you can give me. I am a t1 diabetic for 18 years now. Have always struggled with control. My a1c has slowly lowered, but still need to drastically control my sugars to lower my a1c even more. I have also been struggling recently with rapid and continuous weight gain now. Need some serious help! Finding your FB page today was a Godsend…. I was misdiagnosed 6 years ago as Type 2 but after several years of the wrong medicine and going to multiple Dr’s I ended up in ICU with ketoacidosis in June 2016. It was determined at that time that I am LADA, or adult onset Type 1. I’m finally on an insulin that works but have gained 25 lbs in that time. Not until reading your articles did I realize it wasn’t because of food as much as it is constant highs/lows… That’s me. I hate roller coasters… I need help. Are you available to speak at a Diabetes meeting in Oregon in September , They are looking at a speaker to talk about nutrition and exercise. Thanks so much. There is an honoraium and hotel and travel expenses. Hi Nancy – that sounds like something I’d love to do. I’ve just sent you an email.